Verbeterdebuurt, which translates as 'improve the neighbourhood' is a Dutch Google Maps mashup site that hopes to engages citizens in improving their neighbourhoods. 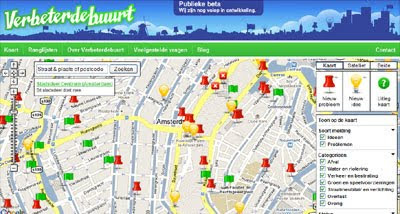 Citizens can use Verbeterdebuurt to post local problems and ideas on a Google Map. The application then sends a report to the relevant council. At the moment 300 of 430 Dutch councils make use of the service. Reported problems and ideas appear on the map as pushpins and lightbulbs. If the council solves the problem or takes up the idea a green flag appears on the map. Residents can add local properties under a number of categories: waste, water and sewerage, traffic and pavements, green areas and play facilities, street furniture, lighting and others. An important feature of the application is that it can be embedded on websites with a local focus. An example is the media partnership with the Amsterdam newspaper het Parool. I just found your blog, and I'm looking forward to seeing more! It's amazing to see how Google Earth has transformed local business marketing. Thanks for the post!